Aeroplane Jelly offers heaps of fun stuff for kids to explore. 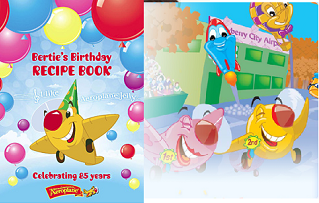 Download storybooks, coloring in sheets or check out their games and party ideas. Inspired by their recipes and want to create your own recipe book? 1. Select your chosen recipes from their recipes section. 2. Rearrange your chosen recipes in the Edit Recipe Section to create your desired recipe book. 3. Give your recipe book a name, save and download it.